IBEW, Seattle Times, NPR.org, and others. No party or celebration will ever top this year’s birthday. 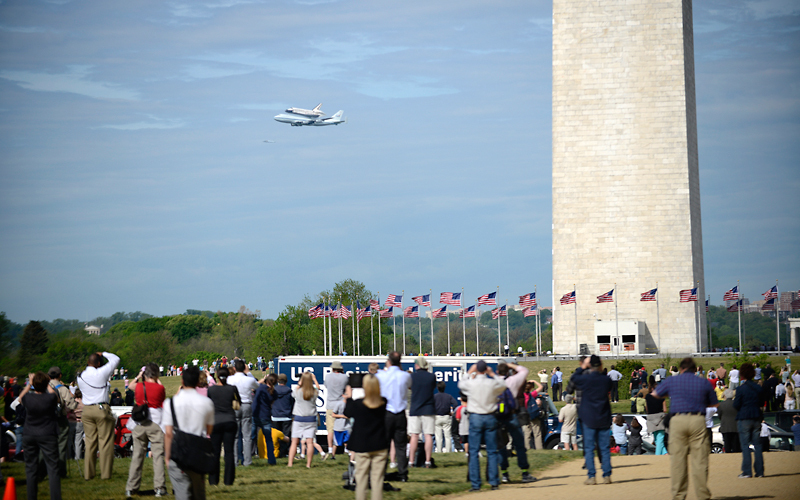 The retired space shuttle Discovery took its last flight atop a 747 from Florida to Dulles Airport, taking about half an hour to make four passes over the DC area for a photo-op. After landing at Dulles Airport (and getting rained on for some more beautiful pictures), it traveled to its new home at the Smithsonian’s Udvar-Hazy Center. I’ll never forget that moment my co-worker* shouted, “There it is!” and it appeared out of nowhere from behind the Washington Monument. Thank goodness I had pre-set my camera’s exposure, so I was ready to catch about five frames on the first pass. This frame was one of my favorites, but ended up as an outtake. It now lives (in this aspect ratio) as the desktop picture on my work laptop. *Haven’t you heard? I started a few weeks ago as a photographer/videographer/editor for the IBEW, where I’ll be traveling around the country – and Canada! – telling stories of neat things happening in the local chapters. Yeah, kinda awesome. I’ll be sure to post fun things from my travels here.